Drop ceilings are suitable for many remodeling jobs, but because of the way they're constructed, they're not designed to support heavy loads, like those of a chandelier. Yet, by using the structural members of the home that the suspended ceiling is connected to, you can hang a chandelier and create the impression that it's suspended from the drop ceiling itself. Suspend a chandelier from a drop ceiling. Remove the tile from drop ceiling, at the spot where the chandelier will be located. Drop a plumb bob down from the nearest ceiling joist. Measure the distance of the plumb bob line from the panels on either side of the removed panel. Transfer the dimensions onto the removed panel. Cut a 1-inch round hole in the panel with a utility knife. Feed the chain and power cord of the chandelier through the panel and a decorative ceiling round. Glue the ceiling round to the panel on the underside. Screw a metal screw hook into the ceiling joist at the location you used earlier for the plumb bob. Screw a gang box into the joist, next to the hook. Feed the power line that will power the chandelier into the gang box from one side. 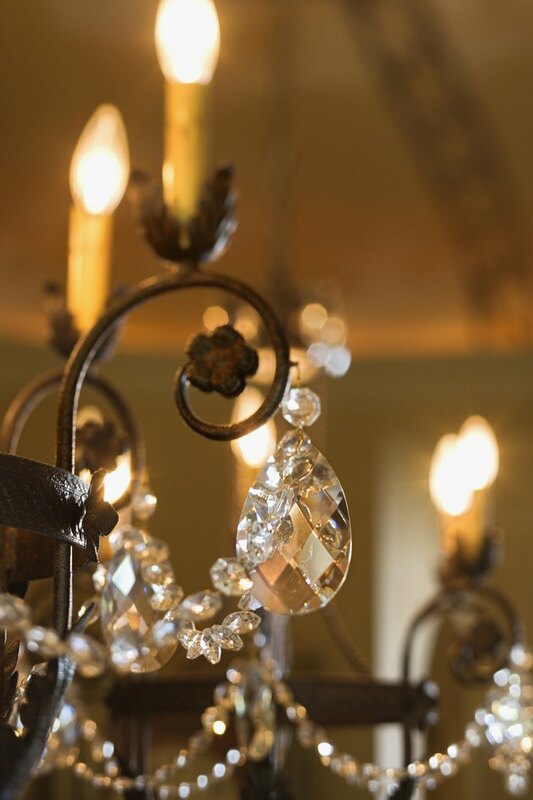 Feed the power cord from the chandelier into the other side. Match the wires of the power cord and the chandelier to each other -- black to black and white to white. Place wire nuts over the ends of the wires and twist until tight. Screw the cover onto the gang box. Hang the chandelier chain from the hook on the joist. Replace the panel into the drop ceiling.